Elvis Costello and the Imposters brought their “Look Now and Then” tour to Saint Louis on Wednesday, the eve before thanksgiving to an impressive crowd of all ages wishing to rock along with the English singer who has been performing for crowds for several decades. At the age of 64, I was surprised to see the energy Costello had on stage – and it’s refreshing to see that he can still shred on the guitar and hit some impressive notes. As he and the bank took the stage, they were greeted by cheers and excitement and the show immediately kicked off with a high amount of energy. ​After winding up the crowd, it was interesting to see the trance-like state the audience was under when Costello decided to slow things down for a few songs. His onstage banter and British humor seemed to be a big hit as chuckles and laughs were heard in between songs as Costello told stories in between performances, highlighting the lyrical plots of his songs and what they were trying to convey. After performing ‘Deep Dark Truthful Mirror,’ and audience was on their feet giving a standing ovation as the performance was utterly amazing. ​Around the middle of the show, some technical difficulties arose that seemed to shut off the microphones and speakers. As many of his adult fans had been drinking, Costello was heckled by drunk fans screaming that they “couldn’t hear him.” Needless to say, he handled the situation in the best manner a musician knows how – he grabbed an acoustic guitar, a bar stool, and sat at the front of the stage performing raw music while the stagehands addressed the technical difficulties. It wasn’t long before the audience began to sing along with him and Stifel Theatre was filled with Costello and his fans singing along to some of his greatest hits. 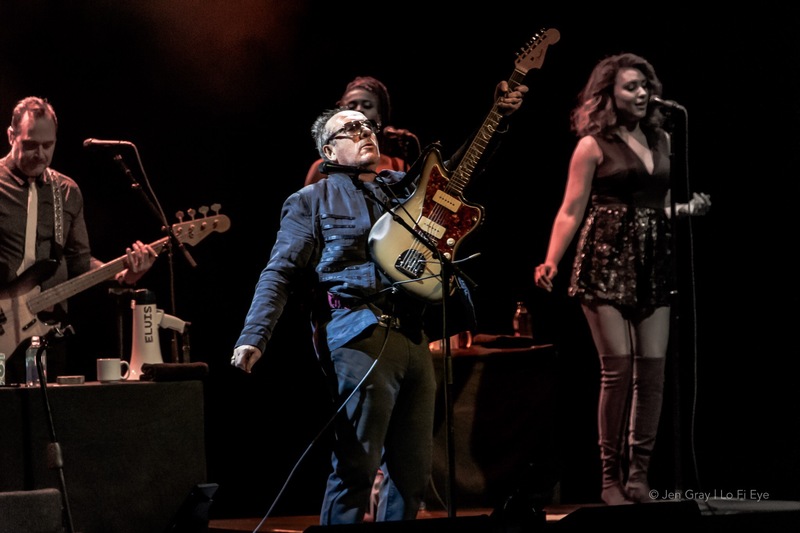 ​After the technical difficulties were addressed, the show was back to its high volume and energy as Costello was joined by his backup singers and dancers for the remainder of the show. The girls got some screams and hollers of their own, as one woman a few rows behind me yelled “I was a little upset he didn’t bring the saxophone, but at least he brought the chicks with him!” He reintroduced his band as well as his female backups, to which each girl showed their impressive runs with their vocal range and mesmerizing stage presence. From then until the end of the show, everything went on without a hitch and the highest energy imaginable from all performing on the stage. And, as most legends like Costello end a show, an encore began soon after, hyping the audience back up with his hit ‘Pump It Up’ and finishing the show with enthusiasm leaving the crowd excited, enthralled, and satisfied.